Another announcement coming out of Tokyo Game Show this past weekend. Nanoblock have announced that six new Rockman sets will be released at the beginning of October for 500 yen each. These sets were also on display alongside the recently announced Takara Tomy Rockman Collection 2 figures on the Capcom Booth at Tokyo Game Show. 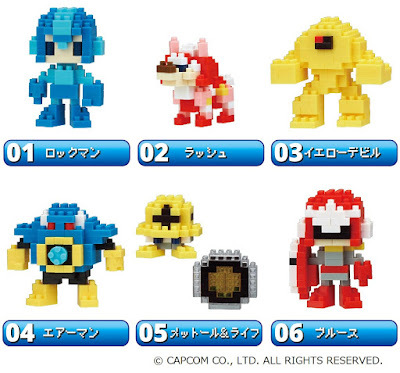 The original Rockman Nanoblocks were released in 2013. They were fairly popular among hobbyists – it's good to see the line is back and lookin' better than ever! Man, it seems Airman's getting a lot more attention lately. These seem to be a little half-assed than the original ones. Might have to pass. Proto done the original way would have been cool. They all look cute! Although Rush looks a little squished.